It's been a tough stretch to be an oil investor. Between the start of the fourth quarter of 2018 and the end of the calendar year, crude oil prices were in freefall, the price of a barrel chopped by around 44% in that three-month stretch. During that rout, crude prices ended lower for 12 straight sessions, the longest losing streak in the history of oil trading. But it's not all ugly for oil prices anymore. That's because, now that no one wants to have exposure to his or her portfolios, oil has been quietly rebounding in 2019, setting up for a potentially long-lived bullish reversal this winter. As of this writing, the classic technical tools put a 25% upside target on oil prices, provided one condition gets met. For our oil insight, we're looking at the United States Oil Fund (USO - Get Report) , an exchange-traded fund that tracks crude prices and has become retail investors' favorite proxy for crude prices. At a glance, it's not hard to see that oil's been an ugly trade of late. But USO found a floor back at the end of December, catching a bid at the same time buying came back into broader equities. Since then, oil prices have been looking "bottomy," thanks to a pretty classic technical price pattern that's actually been forming since mid-November. The setup in oil prices right now is an inverse head-and-shoulders pattern, a bullish reversal setup that indicates exhaustion among sellers. Given the historic rout we've seen in oil prices over the course of the last quarter, it's not hard to imagine that sellers are feeling fatigued at this point. The inverse head-and-shoulders setup is formed by a pair of swing lows (the shoulders) separated by a deeper low (the head). 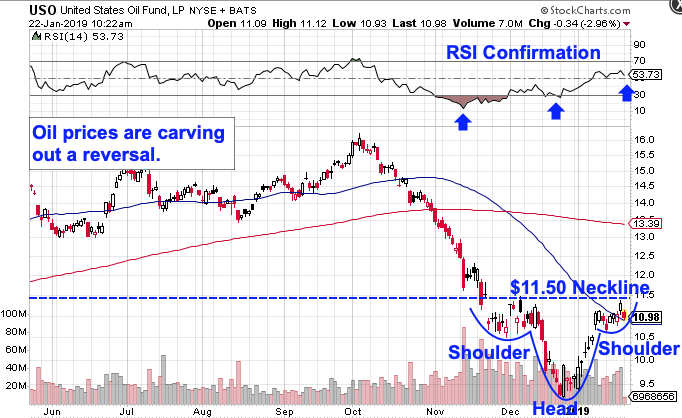 For USO, the buy signal comes on a breakout through this ETF's neckline at the $11.50 level. Momentum, measured by 14-day RSI up at the chart of the price chart, adds some extra confidence to the breakout potential in oil prices. Momentum has been making higher lows during each of the downward swings in USO's price action, signaling that buyers are building at lower levels. USO's minimum measuring objective for its price setup puts a 25% upside target on shares once this ETF breaks through $11.50. That's good reason to keep a close eye on shares in the sessions ahead.